There are a number of big name pick-up trucks in this highly competitive segment. However, when Cars.com and FourWheeler.com authority sites put all of this pick-ups to the test, one truck rose above the rest. In the Cars.com competition, the 2018 Colorado brand came out on top. And the offload authority site Fourwheeler.com gave their trophy to the off-road Colorado ZR2. Yes, the mid-sized pick-up that was re-introduced in 2015 has beaten out big name competitors. 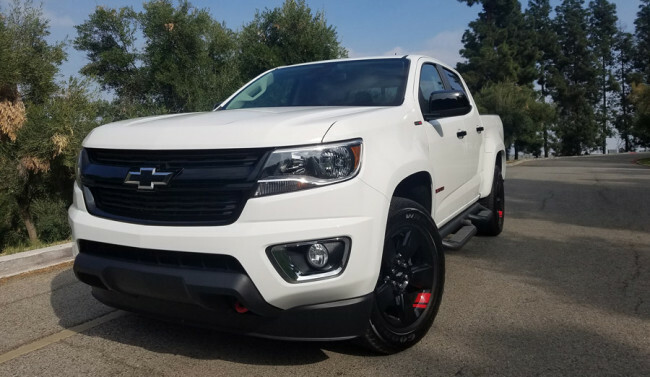 In addition to the many trim levels available for the 2018 Colorado, this winning mid-sized pick-up truck also offers three Special Edition trucks designed to give truck lovers the unique and personal style and performance that stands out. Colorado RST – This Special Edition Colorado joins the RST family of street performance Chevy vehicles. Highlights include 20-inch low gloss Black wheels, RST badge, Colorado badge on tailgate, Black bodyside moldings, and Black rear emblem. Colorado Trail Runner – For those who want a serious off-road performer, the Trailer Runner is equipped to go well off the beaten path. Highlights include ZR2 skid plates, ZR2 rock protection, Goodyear Wrangler DuraTrac® tires, and Black rear emblem. Colorado Redline – This head turning Special Edition features red and black accents that offer an intimidating and unique style. Highlights include Black window trim, Black mirror caps, Black door and tailgate handles, Black bowtie emblems, Black grille and surround, Black Off-Road Assist Steps, 18-inch wheels with Red accents, Red recovery hooks and Spray-on bedliner. So what made the 2018 Colorado a winner? One only has to look at the high-quality exterior and interior features to get a good idea why the Colorado is ranked better than trucks from Ford, Dodge and Toyota. What may be most amazing about the Colorado’s win is that this Chevy mid-sized pick-up is one of the most affordable in the market, with a starting price of just $20,000. That makes the 2018 Colorado thousands of dollars more affordable than the competition. Overall, the 2018 Chevy Colorado is a winner that is within reach of almost all truck lovers.